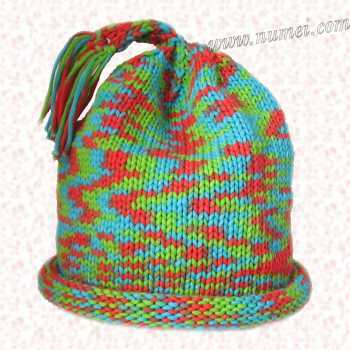 This Child Playtime Hat is so colorful and adorable, it would brighten up your little one's face! It is very easy and quick to make, and uses just one ball of Berlini Alana. Hat will fit head circumference of 14"-18". Knitted Measurements:Will fit head circumference 14"-18""
With Size 7 circular needles, cast on 80 stitches; place marker, join to form ring, making sure not to twist stitches. Work in Stockinette Stitch until piece measures 1 1/2" from beginning. Switch to Size 8 circular needles and continue in Stockinette Stitch until piece measures 7" from beginning. Transfer all remaining 8 stitches to one of the double pointed needles. R1: Knit all stitches; do not turn but slide all stitches to the right hand side of needle. R2: With right side still facing you, knit all stitches. Continue working i-cord until it measures about 2". Bind off. To make tassel, cut 5"-6" strands of yarn and attach to top of i-cord.